Editor-in-Chief Dr. Pauline Ratnasingam, University of Central Missouri, USA. 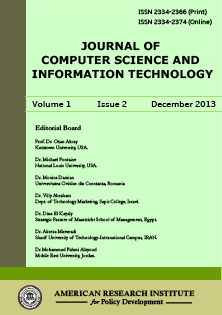 Journal of Computer Science and Information Technology is an international peer-reviewed journal published by American Research Institute for Policy Development. It is a forum for scientists and engineers involved in all aspects of computer science and information technology to publish high quality and refereed papers. Papers reporting original research and innovative applications from all parts of the world are welcome. Papers for publication in the journal are selected through rigorous peer review, to ensure originality, timeliness, relevance, and readability. The journal also seeks clearly written survey and review articles from experts in the field, to promote insightful understanding of the state-of-the-art and technology trends. All research articles in this journal have undergone initial editorial screen and rigorous peer review. Each paper published in Journal of Computer Science and Information Technology is assigned a DOI®number, which appears beneath the author's affiliation in the published paper. Click HERE to know what is DOI (Digital Object Identifier)? Click HERE to retrieve Digital Object Identifiers (DOIs) for journal articles, books, and chapters. Prof. Alan Garfield, University of Dubuque, USA. Dr. Pauline Ratnasingam, University of Central Missouri, USA. Dr. Ze Zhang, Associate Professor of Computer Science, Coker College, USA. Dalibor Stanimirovic, University of Ljubljana, Slovenia. Dr. Jozef Stašák, PhD., Dubnický technologický inštitút (DTI), Slovak republic. Dr. Laith Ahmed Najam, Mosul University, Iraq. Mr. Hamza Zafar, National University of Computer & Emerging Sciences, FAST, Lahore-Pakistan. Dr. Raymond Limen Njinga, Ibrahim Badamasi Babangida University, Lapai, Nigeria. Mr. David Mbabu Nchunge, Jomo Kenyatta University of Agriculture and Technology, Kenya.